Providing you the best range of badminton feeding machine s3025 and s4025 badmintion feeding machine with effective & timely delivery. 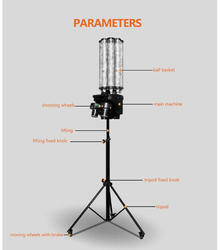 We are offering Mini Vertical Badminton Feeding Machine. 3. High performance of photoelectric sensors makes the machine runs more stably and reliably. 5. The battery with large capacity can last 3-5 hours which allows you to have fun when playing. 8. Adjusting the shooting angle dynamoelectric, highest 8M . 14. One button to choose different horizontal ball. 19. The body structure is dexterous , portable handle ,easy installation . 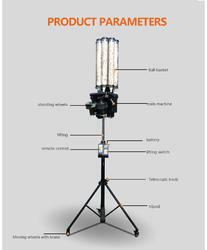 Looking for Badminton Feeding Machine ?